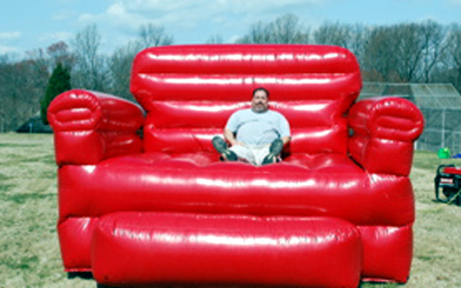 Climb up and feel like a kid again while getting your picture taken on our big inflatable red chair. Great for childrens' birthday parties, company picnics, holiday parties and other special events with photo stations. Includes, inflatable chair and blower. Photo items and attendants additional. Requires electricity (110 volt, 11 amps) and 8'l x 8'w x 9'h space. Includes, inflatable chair and blower. Photo items and attendants additional.